Abstract. It is hypothesized that more accurate prediction and warning of natural hazards, such as of the impacts of severe weather mediated through various components of the environment, require a more integrated Earth System approach to forecasting. This hypothesis can be explored using regional coupled prediction systems, in which the known interactions and feedbacks between different physical and biogeochemical components of the environment across sky, sea and land can be simulated. Such systems are becoming increasingly common research tools. This paper describes the development of the UKC2 regional coupled research system, which has been delivered under the UK Environmental Prediction Prototype project. This provides the first implementation of an atmosphere–land–ocean–wave modelling system focussed on the United Kingdom and surrounding seas at km-scale resolution. 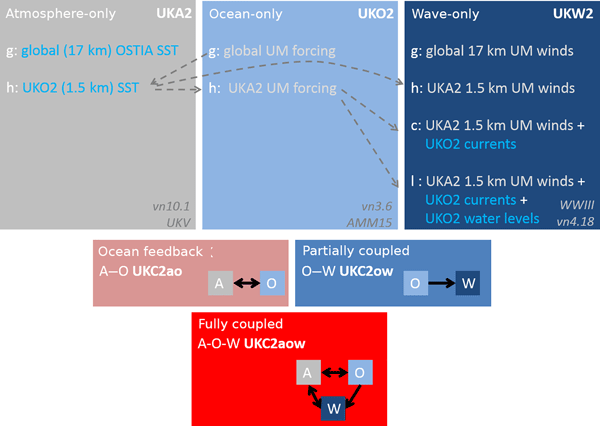 The UKC2 coupled system incorporates models of the atmosphere (Met Office Unified Model), land surface with river routing (JULES), shelf-sea ocean (NEMO) and ocean waves (WAVEWATCH III). These components are coupled, via OASIS3-MCT libraries, at unprecedentedly high resolution across the UK within a north-western European regional domain. A research framework has been established to explore the representation of feedback processes in coupled and uncoupled modes, providing a new research tool for UK environmental science. This paper documents the technical design and implementation of UKC2, along with the associated evaluation framework. 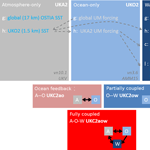 An analysis of new results comparing the output of the coupled UKC2 system with relevant forced control simulations for six contrasting case studies of 5-day duration is presented. Results demonstrate that performance can be achieved with the UKC2 system that is at least comparable to its component control simulations. For some cases, improvements in air temperature, sea surface temperature, wind speed, significant wave height and mean wave period highlight the potential benefits of coupling between environmental model components. Results also illustrate that the coupling itself is not sufficient to address all known model issues. Priorities for future development of the UK Environmental Prediction framework and component systems are discussed. How to cite: Lewis, H. W., Castillo Sanchez, J. M., Graham, J., Saulter, A., Bornemann, J., Arnold, A., Fallmann, J., Harris, C., Pearson, D., Ramsdale, S., Martínez-de la Torre, A., Bricheno, L., Blyth, E., Bell, V. A., Davies, H., Marthews, T. R., O'Neill, C., Rumbold, H., O'Dea, E., Brereton, A., Guihou, K., Hines, A., Butenschon, M., Dadson, S. J., Palmer, T., Holt, J., Reynard, N., Best, M., Edwards, J., and Siddorn, J.: The UKC2 regional coupled environmental prediction system, Geosci. Model Dev., 11, 1-42, https://doi.org/10.5194/gmd-11-1-2018, 2018. In the real world the atmosphere, oceans and land surface are closely interconnected, and yet prediction systems tend to treat them in isolation. Those feedbacks are often illustrated in natural hazards, such as when strong winds lead to large waves and coastal damage, or when prolonged rainfall leads to saturated ground and high flowing rivers. For the first time, we have attempted to represent some of the feedbacks between sky, sea and land within a high-resolution forecast system for the UK.